Happy Hump-day friends. I hope your week is going well so far. Today I thought I'd share a very short-lived manicure with you. I'm sure that many of you would have already seen or heard of manicures using either real lace or hand-painted lace patterns. I've heard about it for some months now and last year saw this YouTube video by LOVE4NAILS. I thought it looked nice, but back then I wasn't really doing my own nails - I was going to those cattle market nail shops (they usher you in, don't talk to you and then boot you out after hacking at your nails with an e-file). I'm not one for wearing 'this season's trend' in nail polish or nail art so I didn't bother trying it. Until now. 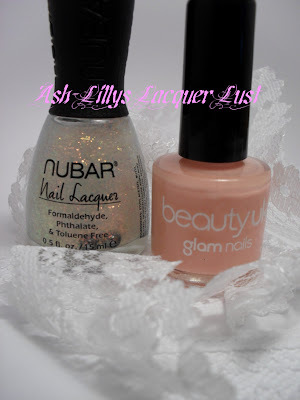 For this I used some white lace border bought from Hobbycraft for £1 a metre (I think), Nubar 2010 - a gorgeous opal flaky glitter in a clear base polish and the very yummy Peach Melba by Beauty UK. I didn't use a topcoat per see. First I painted on two coats of Peach Melba after my basecoat had dried. I cut some random strips of lace to fit my nail, painted on one coat of Nubar 2010 and quickly placed the lace on a fingernail and pressed down. The lace is very, very fine so I put pressure on the thicker, patterned parts of the lace. Had I put pressure on the thinner sections, they would have disappeared into the polish. This is also why I didn't use a top coat. I painted a little white polish here and there and added a few dots. I put a few dabs of old, thick topcoat on the edges in an attempt to stop the lace from lifting. It actually lasted through showers, hand washing, dish washing, children washing and when I did try to take it off, it was pretty stubborn! If this was something I had intended to wear for more than a day I would have used a thicker white lace with more patterns OR black lace. Had I put a topcoat on this lace, it would have penetrated the fabric immediately and become transparent. With black lace, it probably wouldn't have happened and I would have used several layers of topcoat to anchor the lace. I might even have been able to put a layer of UV gel or acrylic over it for extra longevity...but I'm not using any of those things at the moment. Do you like 'lace nails'? Have you worn such a manicure and if so...what did you do to make it last? Oooh Lace nails, oh how I had an experience with them as well. AnnKiin's - I was lucky that it worked the first time. I didn't even bother to do the right hand because there was no way that it would last! Painting, konad or decals is far less time consuming, lol! Isn't she? And her voice is so soothing too. awww it's so pretty!!! really talented!